Is this 55-inch LED, Freeview HD TV for £750 too good to be true? 55-inches of Edge LED television for under a grand? What's the catch? It's fair to say that Kogan is not - yet - a household name in the UK. But if the Australian brand's LED55 TV (also known as the Kogan KULED551HDAA) is anything to go by, this situation could be about to change fast. Here's the deal. 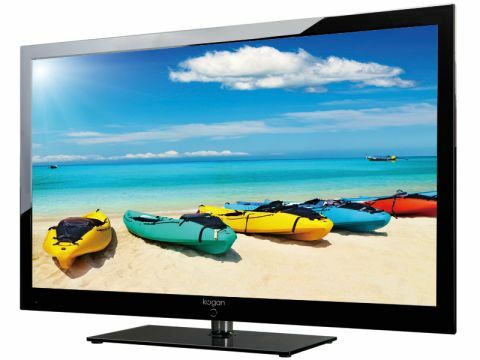 The Kogan LED55, as the no-nonsense part of its name suggests, is a 55-inch TV that uses LED technology. This isn't new, of course, but here's the fun bit: the LED55 can be yours direct from Kogan's UK website for just £750. Including free shipping - it launched at £999 but was almost immediately discounted to £750. The expectation from such a price/screen size/technology equation has to be that the Kogan LED55 is going to be a basic television. Yet actually, a scan of its specifications suggests that it's got quite a lot going on. For instance, it's got a Freeview HD tuner on board, showing that Kogan has taken the trouble to localise its flagship TV for the UK market. It's also got 100Hz processing, suggesting that maybe it's going to spare at least a thought for the small matter of picture quality. Then there's its built-in PVR functionality for recording from the tuners to a USB storage device, while sound comes courtesy of an SRS TruSurround processing system. Even the fact that it uses Edge LED lighting to illuminate the 1080p pixels in its monster screen is significant. It's good to know, too, that the other sets in Kogan's current UK range - including the 42-inch KULED42XHDAA, 46-inch KULED461HDAA and 32-inch LEDBD32, the latter of which has a built-in Blu-ray player - all use LED lighting too. Basically, most things about the Kogan LED55 sound too good to be true.